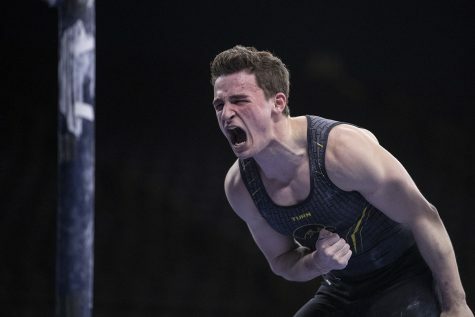 Both the Iowa men's and women's gymnastics teams will be in action this weekend, continuing its drive for success on the season. 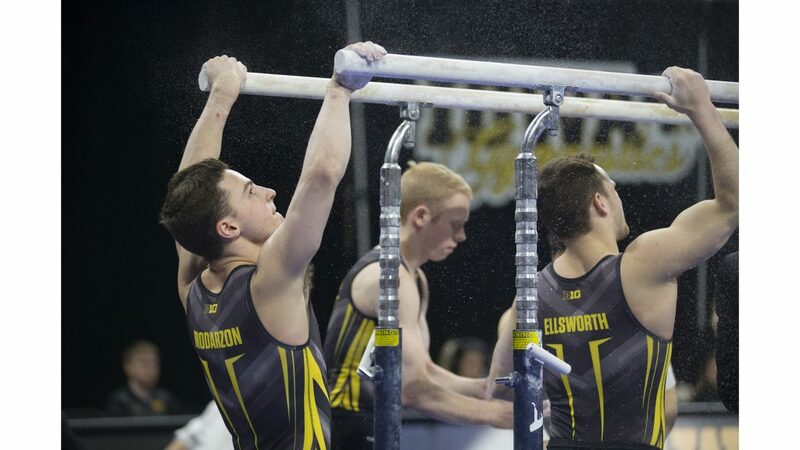 Hawkeye members Jake Brodarzon, Nick Merryman, and Dylan Ellsworth put chalk on the parallel bars before they compete during men's gymnastics Iowa vs. Penn State and Arizona State on March 3, 2018 at Carver Hawkeye Arena. 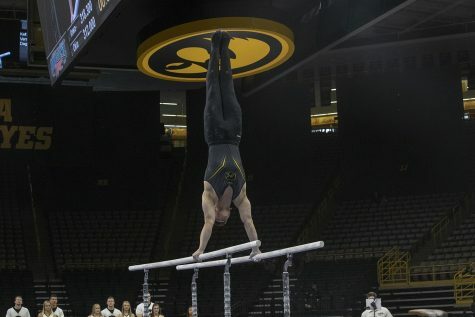 Iowa gymnastics is in full swing this weekend. 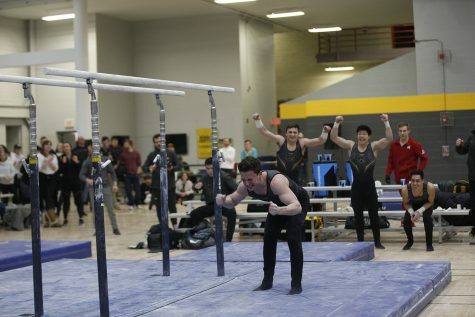 The men’s gymnastics team is facing off against No. 1 Oklahoma in Carver Hawkeye, while the women’s gymnastics team heads to Ann Arbor to take on No. 10 Michigan. The No. 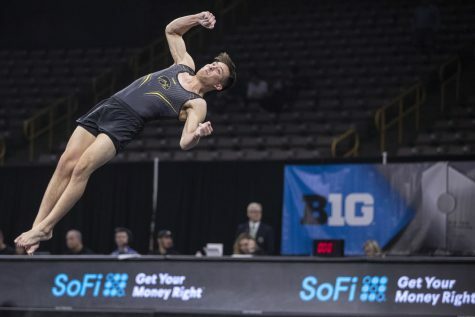 9 Iowa men’s team is coming off a successful home opener vs Illinois-Chicago and Minnesota, as Iowa was able to accomplish its goal of breaking a 400 score. Iowa scored 401.600 to give them second place overall just behind Minnesota. Now that the Hawkeyes are looking ahead to the Sooners, the mentality does not change. One might say that since the top team in the nation is coming to town that practices would be more intense, but that is not the case. The focus is still to continue improving and striving to accomplish the goals the team set. The team is just focusing on a season theme. 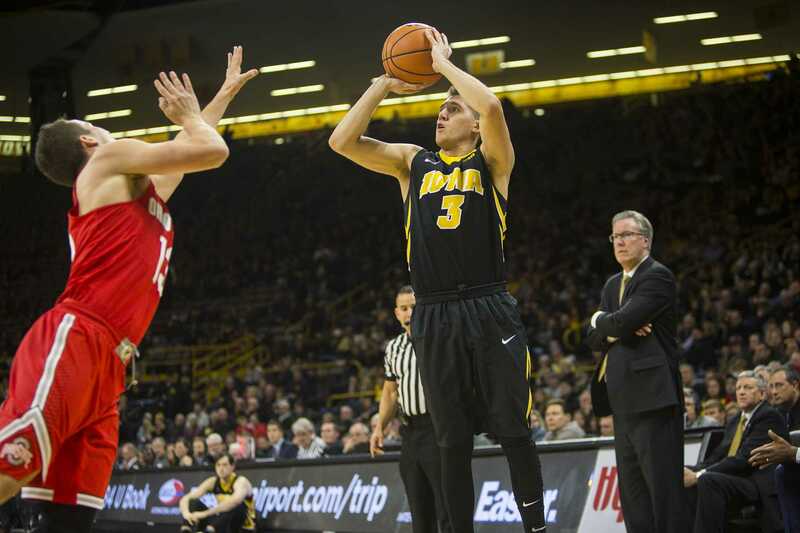 Senior Jake Brodarzon agreed that right now the team is just focused on getting stronger and staying consistent to build some momentum for the remaining portion of the season and off-season. 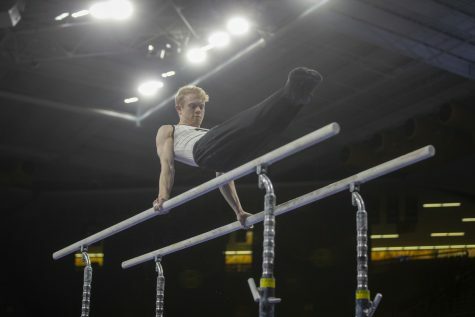 On the other hand, the GymHawks are coming off a tough loss against Ohio State. The difference in points came down to .225 of a point that decided the final outcome. 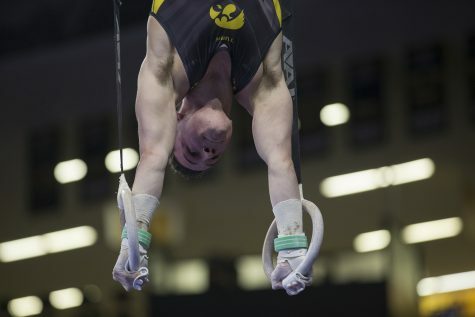 Jake Brodarzon competes on the rings during men’s gymnastics Iowa vs. Nebraska at Carver Hawkeye Arena on Feb. 23, 2018. Iowa fell to Ohio State 195.000-194.775. 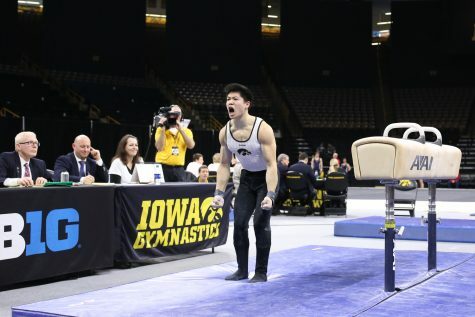 Though it was a tough score to swallow for the GymHawks, they worked hard and set new records on vault and floor on the season. 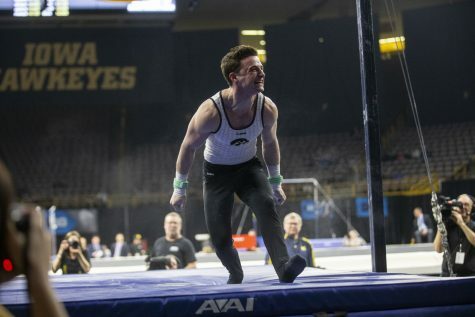 Iowa now has a season-high team score on vault of 48.625 and floor with 49.125. 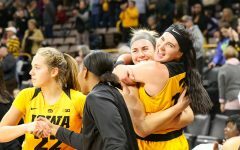 After the nail-biter in Columbus, the GymHawks are 2-4 on the season, while the Wolverines are currently 7-2 on the season and 3-0 in conference, so getting a win against Michigan would be a sweet treat. 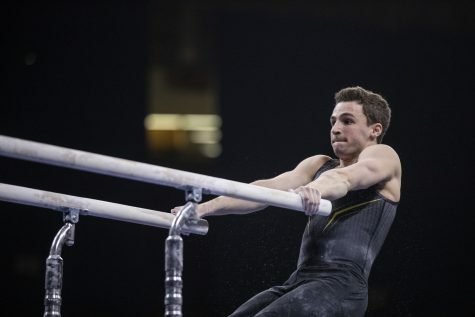 The GymHawks will be looking at some of their star gymnasts who have stepped up to the plate. With a young squad this season, head coach Larissa Libby and her team are proud of the way they have embraced the challenge and taken charge while staying committed to each other. The goal is to win on Saturday, but it is also to stay focused on the teams end goals of supporting each other and continuing the improvement.